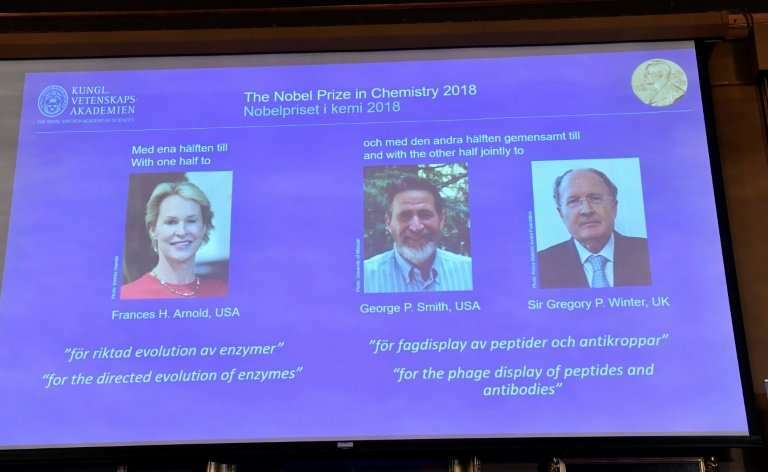 US scientists Frances Arnold and George Smith and British researcher Gregory Winter won the Nobel Chemistry Prize on Wednesday for applying the principles of evolution to develop proteins used in everything from new biofuels to to the world's best-selling drug. Arnold, just the fifth woman to clinch chemistry's most prestigious honour since Marie Curie was honoured in 1911, won one half of the nine million Swedish kronor (about $1.01 million or 870,000 euros) award, while Smith and Winter shared the other half. Life on Earth exists because over the past 3.7 billion years organisms have adapted to their environment, with evolution solving complex chemical problems: fish can for example swim in polar oceans because they have antifreeze proteins in their blood. The trio used the principles of evolution—genetic change and selection—to develop proteins now used in a range of fields, in what is known as directed evolution. Arnold, 62, who has survived breast cancer and is a single mother to three sons, is a professor of chemical engineering at the California Institute of Technology. "I'm bouncing off the walls but I'm trying to pretend to sound calm and collected," she told the Nobel Foundation in an interview, adding she was "annoyed" she couldn't reach her sons to give them the news. "They never answer the phone when Mom calls." Her method of rewriting DNA to mimic evolution has helped solve problems such as replacing toxic chemicals like fossil fuels. As a result, renewable resources like sugar cane are being converted into biofuels. More environmentally friendly chemical substances are being developed, improving everyday products such as laundry and dishwashing detergents to enhance their performance in cold temperatures. "What I do is copy nature's design process. All this tremendous beauty and complexity of the biological world all comes about through this one simple beautiful design algorithm," she told the Foundation. "What I do is use that algorithm to build new biological things," she said. "Nature is solving all sorts of problems that we throw at her such as how to degrade plastic bottles, how to degrade pesticides and herbicides and antibiotics... she creates new enzymes in response to that all the time, in real time." Meanwhile, Smith, of the University of Missouri, and Winter, a 67-year-old genetic engineer at the MRC Laboratory of Molecular Biology at Cambridge, developed an "elegant method" known as phage display, where a bacteriophage—a virus that infects bacteria—can be used to evolve new proteins, the jury said. Pharmaceuticals for rheumatoid arthritis, psoriasis and inflammatory bowel diseases have resulted from their research, as well as antibodies that can neutralise toxins, counteract autoimmune diseases and in some cases cure metastatic cancer. The world's most sold prescription drug—adalimumab, which treats rheumatoid arthritis and is sold by its trade name Humira —is a result of their efforts. "The use of antibodies has resulted in a paradigm shift in the way that we now treat so many diseases which has brought significant benefits to patients across the world and will continue to do so for years to come," he said. Smith told the Foundation that the Nobel was a "great surprise". "I thought it was one of the numerous jokes like 'call coming in from Stockholm!' which is kind of like a meme." But there was "so much static on the line (I knew) that it had to be real." The 2018 Nobel season continues on Friday with the announcement of the peace prize, and wraps up on Monday with the economics prize. The power of evolution is revealed through the diversity of life. The 2018 Nobel Laureates in Chemistry have taken control of evolution and used it for purposes that bring the greatest benefit to humankind. Enzymes produced through directed evolution are used to manufacture everything from biofuels to pharmaceuticals. Antibodies evolved using a method called phage display can combat autoimmune diseases and in some cases cure metastatic cancer. Since the first seeds of life arose around 3.7 billion years ago, almost every crevice on Earth has filled with different organisms. Life has spread to hot springs, deep oceans and dry deserts, all because evolution has solved a number of chemical problems. Life's chemical tools – proteins – have been optimised, changed and renewed, creating incredible diversity. This year's Nobel Laureates in Chemistry have been inspired by the power of evolution and used the same principles – genetic change and selection – to develop proteins that solve mankind's chemical problems. One half of this year's Nobel Prize in Chemistry is awarded to Frances H. Arnold. In 1993, she conducted the first directed evolution of enzymes, which are proteins that catalyse chemical reactions. Since then, she has refined the methods that are now routinely used to develop new catalysts. The uses of Frances Arnold's enzymes include more environmentally friendly manufacturing of chemical substances, such as pharmaceuticals, and the production of renewable fuels for a greener transport sector. The other half of this year's Nobel Prize in Chemistry is shared by George P. Smith and Sir Gregory P. Winter. In 1985, George Smith developed an elegant method known as phage display, where a bacteriophage – a virus that infects bacteria – can be used to evolve new proteins. Gregory Winter used phage display for the directed evolution of antibodies, with the aim of producing new pharmaceuticals. The first one based on this method, adalimumab, was approved in 2002 and is used for rheumatoid arthritis, psoriasis and inflammatory bowel diseases. Since then, phage display has produced antibodies that can neutralise toxins, counteract autoimmune diseases and cure metastatic cancer. We are in the early days of directed evolution's revolution which, in many different ways, is bringing and will bring the greatest benefit to humankind.